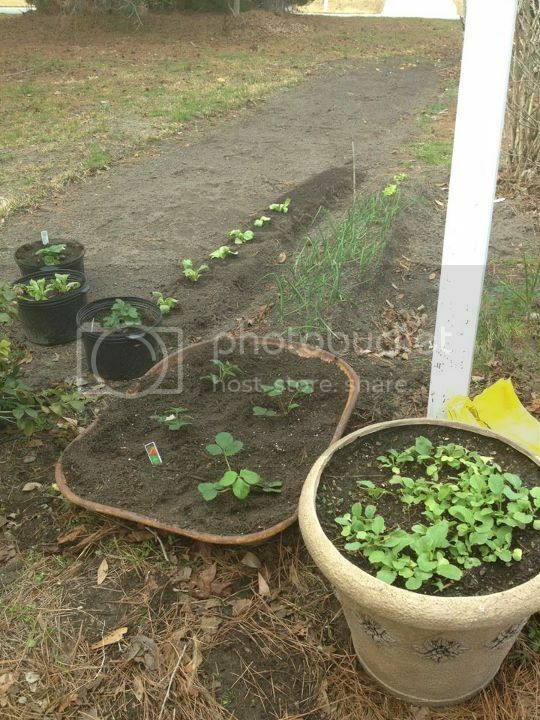 So i have already got a good start on my vegetable garden this year. This is only my second season gardening, last year i fell in love with it. Anyway i got my onions in early, not as early as i wanted but they are doing well right now. I have romain and iceberg lettuce in the ground and both doing well. Some seed and i transplanted a few. Pot of radish's are going crazy! first time growing them and i am experimenting with a big pot. 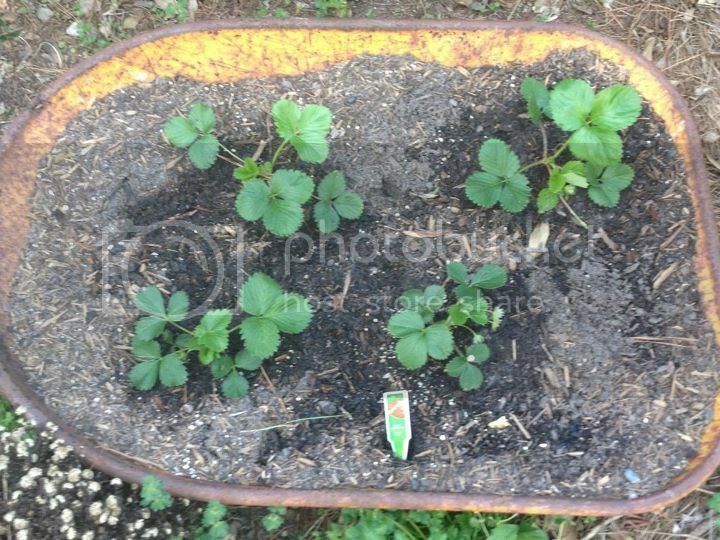 Planted 7 strawberry plants and plan to plant more either today or tomorrow. Oh and also planted abunch of peas that are coming up good! So how far along is everyone else? Lucky you. I have 6 inches of fresh snow on my garden. It was 23Ã‚Â° this morning. The only thing I am growing is ice. I got a few tomato and pepper seedlings. I also got a few flower and herbs going too. I don't have any lights so I keep them outdoors and put them in a spot that only gets morning sun. But when it is rainy or windy I have to bring them in. I think this is causing them to grow really slow and I am thinking about going and buying a light. Today I might start another pepper and some basil. I planted 9 strawberries 2 days ago. Your year so far is sounding similar to mine! I started out rough, as a lot of my first sets of starts were really leggy and I had to start again, but I'm moving along. Slowly, but surely. I've got several banana pepper plants started and a bell pepper too. Last year I couldn't get any but 1 to start from seed, and I'm having better luck in regards to that this year! I've also got some lettuces, brussels sprouts and some squash, a watermelon & a pumpkin i started too early that are on their first set of leaves. I'll be starting my cucumbers, tomatoes, etc here in 2 weeks or so. So far in my garden there are now 14 tomato plants, 6 eggplant with 3 being Ichiban and 3 being white globe, 4 bell pepper, 4 Hungarian wax pepper, 4 Jalapeno pepper, a couple hundred onions, swiss chard, kale, artichoke, squash and several varieties of leaf lettuce that are growing nicely. There's also several herbs in the beds or pots that are doing very well. I also have 12 ft. of cucumbers and 24 ft. of Asparagus Beans (Japanese Yard Longs) on trellises that have broken ground. There's also 25 ft. of a double planted row of soybean to be used for Edamame that have broken ground. Still to go in are several more tomato plants and 8 broccoli that are still in starter pots. I'm not sure how the broccoli will do since it is getting warmer. Once the temperatures get into the 80 consistently, I'll throw in about 30 okra plants to finish things off. I know many of you are still surrounded by cold, nasty weather but your time to plant is fast approaching. My garden will be struggling or mostly done by late July/early August with our heat. You can tell the southerners! About the only thing I'm eating out of my garden so far is spinach that over wintered from last fall, and a little bit of herbs. I have some broccoli, chard, and a few lettuce plants that overwintered, as well as garlic and onions I planted in fall. I planted seeds of lettuce, chard, spinach, radish, onions/chives a couple weeks ago, but with the variable weather and a couple snows in there, they haven't sprouted yet. I have this year's broccoli seedlings outside hardening off, with dill and fennel. And I have currently 11 flats of seeds/seedlings under the lights in my basement, soon to be more as I keep spreading out and potting up. sounds like everyone is off to a good start. Other than those burried in snow. 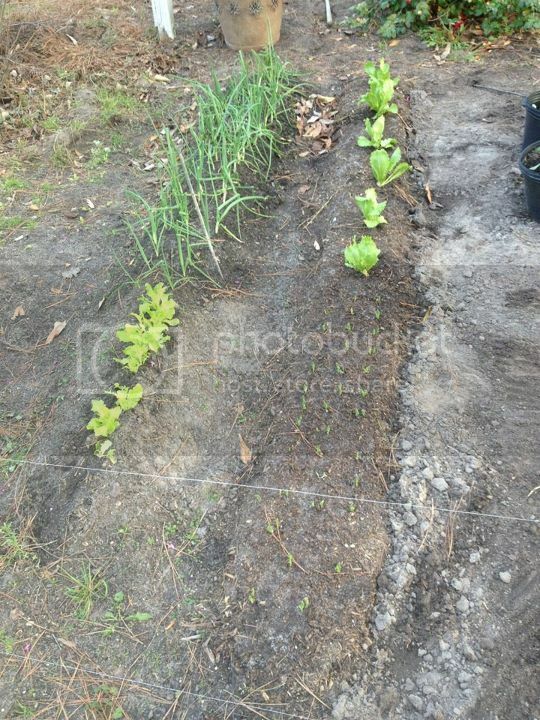 Got onions, romaine lettuce Chinese cabbage, carrots growing in my first year raised bed. So far so good. Boy those carrots seeds are little ! Two long rows of potatoes and collards spinach, turnips, red cabbage. Second year doing seedlings and that is fun! They are doing good. Got two 4ft shop lights side-by-side to give a wide cast. Homemade 1" PVC stand with adjustable chain... on a timer ... that's it.... just keep watered. Got seedlings for 3 different kinds of tomatoes. Bell pepper, banana peppers, egg plant. You can really save some money growing your own transplants. Harvested my first asparagus this year. Planted last year. Gonna try to only harvest < 20% so roots can really get established. How do cukes and melons handle in your area come July? And peppers? jal_ut wrote: Lucky you. I have 6 inches of fresh snow on my garden. It was 23Ã‚Â° this morning. The only thing I am growing is ice. James, it was 21Ã‚Â° here this morning but, I think, the snow melted during the warmer weather a couple of days ago. It is still around in my neighbors yards, tho'. Some of the soil has thawed - the beds right against the south wall of the greenhouse . It is good to know that the ice won't be in the ground forever and warmer days are in the forecast! The only veggies coming up indoors are the leeks. There's a container with lots of snapdragon seedlings at my elbow but . . . this is the vegetable forum . . .
Cucumbers and peppers, especially the hotter varieties like Jalapeno, Hungarian Wax, Habanero all handle the heat pretty well. By the time July hits, the tomatoes are done for the most part and so are most of the leafy salad vegetables due to the heat. However, to keep most things from dying, it takes a good bit of watering at least 3-4 times a week. I have found Okra to be almost indestructible. It can handle heat and drought conditions very well. I can't address how melons would do for me personally because I don't grow them due to the space they require. I know of many folks that do grow them here and in Mississippi and they do well in the heat as long as they get sufficient water. Let's see, garlic is about 6 inches high. I've got my peas planted in my newly made 10' x 2.5' cloche box...they haven't sprouted yet. Got my artichoke seedlings outside in protected locations. We're still getting hard frosts and some snow around here. My hope is to get the peas harvested in time to plant tomatoes in the cloche box. Brandon, your garden rocks ! It doesn't look like a mini garden to me because all I can do is container gardening. Are strawberries pretty shallow rooted? Looks like you are growing them in an old broken wheelbarrow.